Earlier this year I watched a programme on TV about a fanciful idea to construct a parkland walk across the Thames between the bridges of Waterloo and Blackfriars. 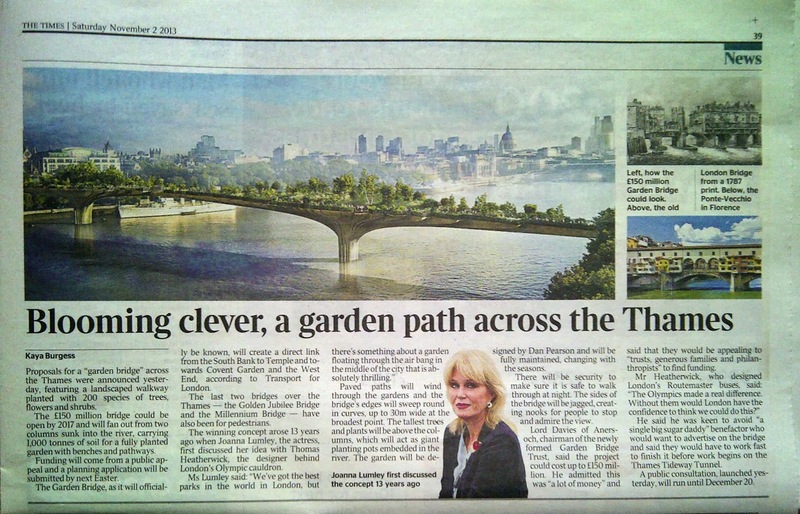 Joanna Lumley takes credit for the idea and in the programme she was seen in meetings with Thomas Heatherwick (he of the Routemaster and the Olympic Cauldron). They mused over scale models and stood on the river discussing how lovely it could be. But it would cost £60million. Last Friday 1st November, the plans were officially announced – it transpires they underestimated the cost as the figure now quoted is £150million which, to quote Lord Davies, Chairman of this scheme, is "a lot of money". Well, it's all very lovely, and Ms Lumley says, "thrilling", but haven't we got got better things to be to be spending this sort of money on? I thought we were in a slump, scrabbling around to pay for road maintainence, health care, transport etc. And where is this obscene amount of dosh going to come from? I suspect from foreign investors, or the huge percentage of rich Malaysians, Russians and other rich businessmen who hail from the Far East and live here a few months of the year. We have until December 20th to find out if this will come to fruition. If it does go ahead I expect we will see a lot of similar 'iconic' structures popping up all over the world, just like what happened with the Millennium Wheel / London Eye – like this and this, each one aiming to be the biggest, highest, longest etc. Like you I feel that there are other more pressing causes to spend massive amounts of money on. To me it also comes across as just a vanity project for Lumley. I like her but, is it just me, or is her voice extremely annoying?! I think she speaks as though she is used to being constantly indulged. She's great as Patsy though, I'll give her that.